It's time to "embark" on your new journey and celebrate with others! These "Fall for Love" acrylic boxes are ideal favors for fallthemed weddings and events. 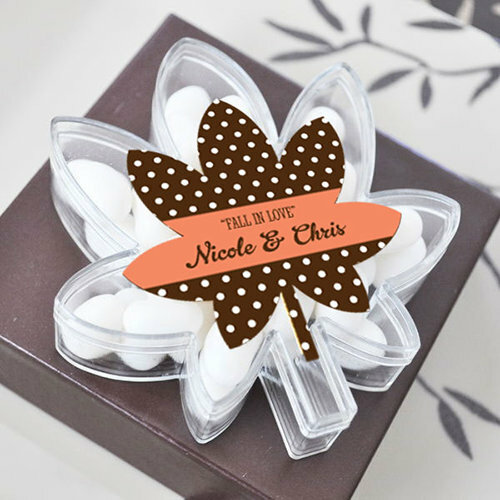 The tree-shaped boxes and personalized labels echo the autumn atmosphere of your wedding. These clear leaf shaped containers, complete with personalized leaf shaped labels, are ideal for storing candy, nuts, bubble gum, chocolate and much more! They can also be refilled and reused by your guests and become permanent keepsakes that will remind them of your special day with every use. Your guests will immediately "fall" in love with these custom favors. Due to the personalization for this product the minimum order is 24. Boxes arrive separate from the labels.